user warning: in F:\AROC-UK\Site\modules\dblog\dblog.module on line 147. Marking 65 years from Italian F1 World Champion Nino Farina registering a lap record at Silverstone while driving the legendary Alfa Romeo 159 which was adorned with the iconic Quadrifoglio badge, the 2016 range-topping Alfa Romeo Giulia Quadrifoglio can now lay claim to another record-breaking accomplishment completing the lap on the National Circuit in 1:44.3secs, matching the 1:44secs set by Farina in 1951. Despite the car windows being covered entirely in a black vinyl, the hotly-anticipated sports saloon, powered by an all-new aluminium 510hp, 600Nm Bi-Turbo V6 petrol engine, navigated the seven-turn, 1.64-mile course and reached speeds of more than 100mph. Clearly a challenge of this magnitude would require rigorous preparation. With the Quadrifoglio driven by Ed Morris – the youngest ever British driver to compete at Le Mans 24 hour – and David Brise directing from a second Quadrifoglio behind, the drivers spent two days getting to grips with the challenge, first practising on the smaller Stowe Circuit, before moving onto the iconic National Circuit. 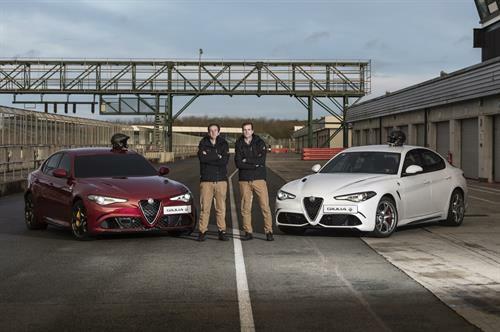 To make this achievement possible required more than just driver determination and memory power, the Alfa Romeo Giulia is packed full of high-performance technologies that allowed the driver to be truly at one with the car. The Alfa Romeo Giulia is equipped with the Alfa Chassis Domain Control (CDC) system, which is a sector first, distributing the power evenly through the Torque Vectoring & Active Suspension systems to ensure maximum drive through the rear wheels. The “brain” is dedicated to vehicle dynamics – combined with the front Active Aero Splitter and rear air diffuser which helped keep the rear-wheel drive Alfa Romeo Giulia Quadrifoglio ‘glued’ to the track, while the on-board Alfa Connect infotainment system allowed the driver to stay in touch with the support team. In addition, and working almost as a sixth sense for the driver, the active safety systems such as Forward Collision Warning (FCW), Autonomous Emergency Brake (AEB) with pedestrian recognition and Lane Departure Warning (LDW), allowed the driver to have complete confidence in the task at hand.